ID Bore of 2", a width of 4.25" including retainer. 4" wide x 6.25" OD. 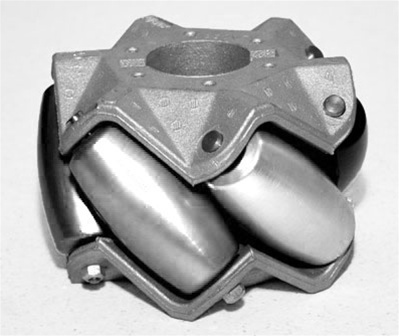 The 6 aluminum rollers are mounted around the outside of the housing at 45 degrees and are 3.35" wide, 1.75"OD at the center, and 1.3"OD at the ends with two bearings each. The roller axles are hardened alloy steel .3125" diameter. The rollers can be removed with a wrench. Load Capacity = 200 lbs.